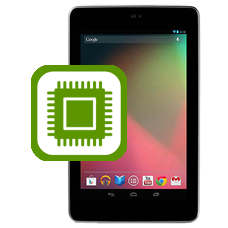 If your Asus Google Nexus 7 logic board has failed, allow our expert technicians to install a new part. A complete replacement logic board for the 16GB Google Nexus 7 WiFi Model ME370T will be installed into your tablet, fully tested and express return shipped to you. Please note this is not compatible with the 3G Nexus 7 models, this Nexus 7 logic board replacement repair is suitable for the WiFi only model ME370T. This is an in-house Asus Google Nexus 7 repair service, when ordering this service you are required to ship the tablet into our repair centre for works to be undertaken.